Gift certificates are entitlements to purchase a certain value of goods from a retailer or other vendor. They're usually only good for the specific vendor, although some may be used across franchises or other associated businesses. The gift certificates are bought by another party, or provided by the vendor, to the purchaser, who may use them to purchase goods. Some gift certificates are effectively discounts, offered by the vendor. These vendor-given certificates are often time-expired, valid only for a certain period. 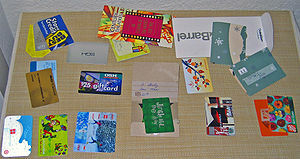 An assortment of gift cards, many from U.S. national retailers such as best buy, target and home depot.